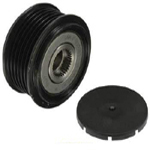 Choose from our assortment of pulleys that will allow you to adapt alternators for special situations. Maybe you need more alternator RPM to increase amperage. Using a smaller diameter pulley will accomplish this. Make sure that the belt tension is still correct once the new pulley is installed.